The corner of Thirty-first and Main in 1940. The corner of 31st and Main today. (Note: This post was originally published in September of 2015). 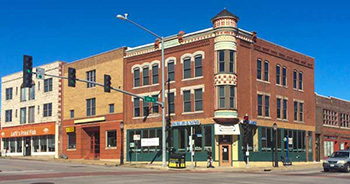 The building at the corner of 31st and Main is one of Midtown’s most distinctive, known as the Jeserich or the Tower Building. 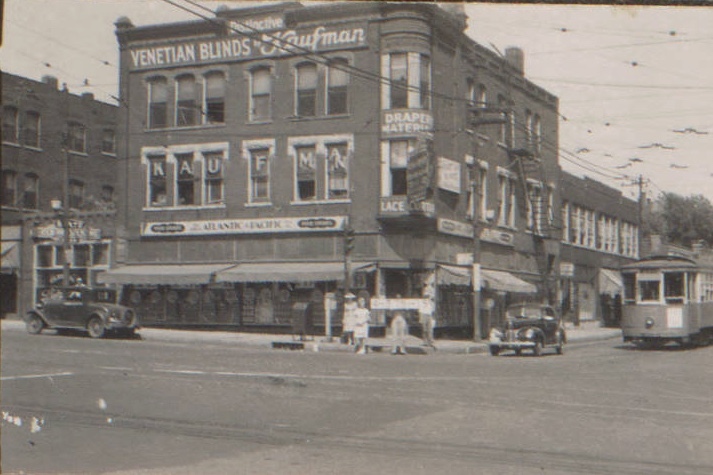 Around 1900 the corner housed a drug store, and in the 1940 photo above, it was the factory and salesroom of the Kaufman Window Shade Company. It is part of the block from 30th to 31st, Main Street to Walnut, the focus of today’s look back at Kansas City in 1940. The corner was an important crossroad in Kansas City, with streetcars traveling down both Main and 31st Streets making this a crowded area. 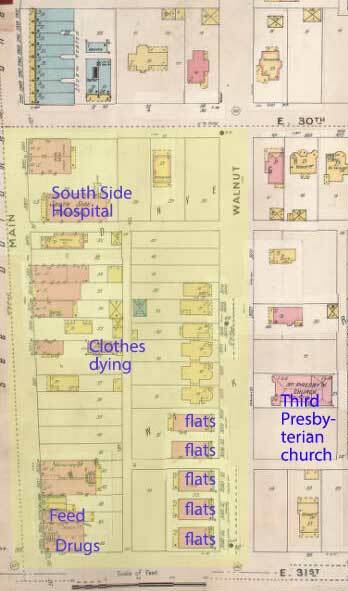 The 1896-1907 Sanford Fire Insurance map shows the block. Around the corner on Walnut Street a row of flats and six houses provided homes for early South Side residents. There’s a lot more history to the block. Do you have memories of the area to share? If so, email us and let us know what you remember. Historic photos courtesy Kansas City Public Library – Missouri Valley Special Collections. I live in a south OP senior campus now, but grew up in the 1940s in the Valentine area, going to the Norman School and ice skating at the Playmor rink. I think many here also grew up in midtown KC. Thus I’m wondering if you would consider speaking at our campus. If so, I’ll pass on your info to the program manager here. Rene: Absolutely. I would love to tell you what I know and hear what you know. Let’s set something up.